Enough with the white thugs, Hollywood. I grew up in Bakersfield, California, a place white thugs (“peckerwoods”) actually exist, a by-product of the Okie migration. A sleep-deprived skinny white dude with “suicidal” tattooed on his forehead is a scary thing. There are lily-white neighborhoods in northwest Bakersfield that I have never—and will never—venture into, day or night. Bakerfield’s white thug has fictional analogues: Justified’s hillbilly mobsters and the Nazis who’ll cause Walt to buy that M60 on Breaking Bad. And I’m sure that this white thug exists in every part of America. You just don’t see them often in the movies because they are “white trash,” one of the many thoroughly misrepresented and ridiculed groups on film or in print. But you see a lot of the other white thug in crime fiction and film. He usually has hair thoroughly greased, a weasely goatee, and wearing a leather jacket over a hoodie. He’s usually Irish Catholic, or at least vaguely ethnic. (Though not Italian. They got their own movies.) And he’s usually from Boston. 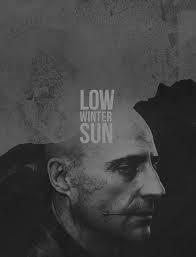 On FX’s new cop drama Low Winter Sun, he lives in Detroit. Low Winter Sun takes place in Detroit. And the thugs are white. The Show is essentially a cop story, and a pretty good one so far. (Is anyone surprised that it’s a remake of a British show?) For my purposes here, I’m only interested in the subplot about a group of skinny white kids who are starting up a drug-and-prostitution business. That in and of itself doesn’t bother me. Except for the fact that I read a lot of crime fiction and watch a lot of crime films. And, nine times out of ten, the characters are mostly white. Like in fiction and film generally. But I’m not writing about legitimate art. I’m writing about crime. Before we get to far into this, let me state unequivocally that I don’t for an instant disagree with the fact that in our media, African-American men are depicted overwhelmingly in a negative way. But that’s the news, political discourse, and, disturbingly, Twitter feeds. In the world of seems to me that we don’t see a lot of young black male criminals unless it’s a work marketed as “urban.” Or the black thug is simply there to be arrested, usually by a white, sometimes along with his black partner. For those films and books for a more “general” audience, expect white criminals. Granted, white people commit most of the crime in this country. While black and Latino men fill our prisons, this is more a cause of racially-targeted policing, prosecuting, and sentencing practice than of who is actually committing crimes. So, if we want an accurate portrayal of a “criminal,” a white guy isn’t that far off. But here’s the thing about crime fiction: it often causes us sympathize with the criminal. We identify with him or her, we understand why they do what they do. Even if we’re sure or hope we wouldn’t do the same. And when it dovetails with actually existing social issues—especially race and poverty—crime stories can expose aspects of America that rarely merit the establishment media’s coverage. Crime fiction has the potential to expose middle class white America to realities never experienced. It doesn’t always have to do so—and it doesn’t have to. Sometimes, most times, I want something fun. But, why not teach me something once in a while? This is why The Wire was such an important show. For five seasons, it portrayed the reality of black inner city neighborhoods, a stark and sustained examination of the power of the drug economy in poor black communities. For many—myself included—this brutality and desolation was shocking. How many white people would have watched The Wire had it not been a cops-and-drug-dealer show? Had it been a drama, would people be calling it “the best show ever”? Justified does the same thing: exposes the drug economy of a poor community, only this one is mainly white. Like west Baltimore, Harlan County is a forgotten community. In many ways, places like Harlan receive even less attention than the inner-city, given our media’s urban and bicoastal biases. I would imagine that many people learned about the pill epidemic in white rural America. Low Winter Sun’s white thugs seem to me to be more common. (I don’t have any statistics to offer, mainly because I didn’t bother looking.) There’s the whole Boston Irish genre of movies: The Departed, The Town, Mystic River, The Boondock Saints, and other I don’t care to write out. (I’m not happy about having written that last title.) Even Veronica Mars—which I’ve only recently begun watching—has the FitzPatrick brothers. There are Irish Catholic thugs in Balboa County? It gets a pass because the whole show is pretty silly. And good. Hollywood loves the Irish Catholic or “vaguely-ethnic” thug. It gives handsome white actors who can’t play Italian a chance to portray “real” characters, i.e. urban working class whites. Of course, Hollywood doesn’t make movies about the working class, white or otherwise, unless it’s a movie about a union…or a crime film. Ray Donovan, in addition to not being very interesting, is Hollywood’s Irish Catholic thug fascination at its most egregious. They finally figured out a way to make a story about Boston Irish criminals, without actually having to go to Boston. Set it in LA! So, the ball is dropped, Low Winter Sun. You had the opportunity to use a crime story to expose the poverty and desperation of post-industrial black inner-city Detroit. Instead, I get vaguely “ethnic” white guys. I’ll watch the new episode later tonight.